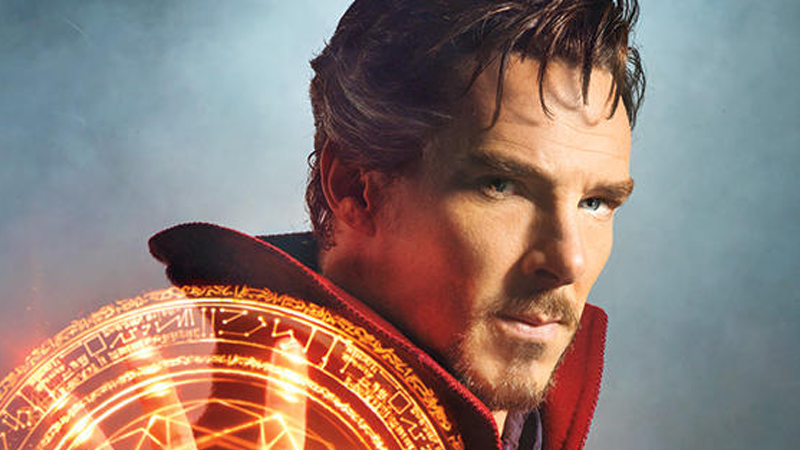 By the hoary hosts of hoggoth, it’s the Sorcerer Supreme! We’ve had set pictures, and teasing glimpses through concept art, but this is it: our first official look at how Benedict Cumberbatch will appear as the master of all things mystical in the Marvel universe. That beard. That cloak. That magic! Oh my. Maybe it shouldn’t be surprising at this point, but I am genuinely shocked at how close this adheres to Strange’s classic costume from the comics—it’s all there, the color scheme, the cloak, the eye of Agamotto dangling from his neck, It’s all there—right down to Strange’s greying hair. It really has leapt off the page of a Doctor Strange comic into real life, and it looks great. I’m still in the infancy of learning all that. It was like, okay, I’ve got to keep throwing these poses, these spells, these rune-casting things, everything he does physically. I’m thinking, there’s going to be a huge amount of speculation and intrigue over the positioning of that finger as opposed to it being there, or there. And I’m still working on that. We haven’t played any of those scenes yet. I felt really self-conscious. But, then, by the end, it was great. It’s like anything, you just have to experiment. The sorcerer supreme sounds like he’s in very good hands. Updated: Entertainment Weekly has also confirmed that Mads Mikkelsen (Hannibal) will be playing the main villain of the movie. Marvel Studios president Kevin Feige says that he’ll be a “sorcerer who breaks off into his own sect” who “believes that the Ancient One is just protecting her own power base and that the world may be better off if we were to allow some of these other things through.” The name of the character is still under wraps, with executive producer Stephen Broussard saying that no one has quite guessed his character yet.